The Writing Life: Why Is This Oct Book Ranked So High? Why Is This Oct Book Ranked So High? I am not a huge Seth Godin reader but I did mention one of his Ebooks several months ago. I know many people who run out and get his latest book. I've never purchased one of his books--until Tuesday when I forked out almost $18 to Barnes and Noble for a book which will not release until mid-October. Why? Because I wanted to be a part of the tribe. Godin writes one of the most popular business related blogs on the Internet. Tuesday I happened to read his entry which asked, "Are you in the tribe?" 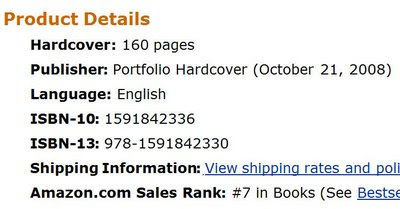 Then I went to the page for the new book, Tribes: We Need You To Lead Us, on Amazon--and noticed that it was ranked #7. Notice on his blog, Godin says he is announcing this exclusive group called a tribe on his blog and anyone who joins this exclusive group must be committed enough to advance order his book. If you purchase the book and email the information to a special address, then they will begin sending out invitations to this special place. Godin is using his market wisdom to the max and building "a safe, well-lit place online where like-minded people can connect." Sounds like the height of social networking to me so I joined in and I'm looking for my special invitation and numbered badge. I found Godin's Squidoo page, Are you in the tribe? and he begins, "INVITATION LIST CLOSES ON JULY 30 AT 11 am ET! After that, we'll have a waiting list, which we'll open as we think the tribe can handle the traffic." Notice the exclusive nature of this group when he writes, "Members get a password and the privilege of meeting each other, posting thoughts, connecting to big ideas or projects and more. It will include excerpts from the book as well as a chance to contribute to a new jointly-authored ebook. The contents of the tribe forum won't be posted to the public until October, so it's really the only way to participate until then." 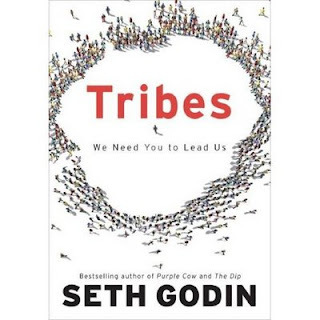 What intrigues me about Seth Godin's effort to get people into the tribe is that it involves the advance purchase of his book. The rank on Amazon mirrors the hoopla around the release of the last Harry Potter book which stood at the top of the Amazon rankings for months before it was released. Can you learn something about book marketing from this effort? Is there a way to build advance enthusiasm for the release of your book? Especially difficult for fiction... well, for the first time fiction writer. We've gone through the whole "fiction platform is it needed?" thing before so I won't go off on that tangent. I guess I struggle with the whole "look at me aren't I awesome" complex. I do NOT want to be one of those self-righteous “I'm better than everyone else” kind of people that want all the attention. I don't mind attention, I'm just usually not an attention seeker. "Pride goeth before a fall" was drilled into my head growing up, the whole "less of me and more of God" theology. I started my own website the other day. My BIL is a computer programmer and he’s hosting it for me. It is mostly a shell at the moment, but I'll be making it official soon. And even then I feel weird to have a kristaphillips.com with my picture on it. I’m excited, no doubt, but just struggling to reconcile everything. Looking forward to the day that I can have my BOOK(s) to market. Instead of "Hey look at me, I'm awesome," I can say, "Hey look at this book God inspired me to write, it's awesome!"